Warhammer Fantasy Battle, or WFB for short, was first released by Games Workshop in 1983. It was fueled by the Dungeons and Dragons craze of the early 80s and quickly gained a large following. It is now in its 7th edition, which is included in the Battle for Skull pass starter set. Unlike Dungeons and Dragons, Warhammer is primarily a strategy game played with 28mm miniatures. It is played on a 4' by 8' table, although a smaller area will suffice. Play takes place in turns. First one player moves his pieces, shoots, casts magic, and resolves combat by rolling 6 sided dice. Then the opponent takes his turn. Like most wargames WFB tries to strike a balance between ranged and close combat. The various editions have shifted the focus of the game amongst the heroes, and troops. In the current edition there are 15 main forces. The strategies used in the game are derived from those used in actual military conflict. Most armies specialize in a particular strategy. For example the High Elves commonly employ bowmen who are supported by spearmen, very much like the English in the Hundred Years War. The Brettonnians with their knights are very much like the French in the Hundred Years War. The following paragraphs briefly describe each army. The Beasts of Chaos are half man and half goat. They use tactics that are similar to the early british. They rely on ambushes, and a fast attack with their chariots. The Bretonnians look and fight very much like Medieval knights. They rely on a fast assault and the shock of the charge to break the enemy. Inexpensive units that do not break, like zombies, are best avoided. Artillery can lay waste to your army. Pegasus Knights and Eagles are commonly used combat this threat. The Dark Elves have troops with a potent attack, but poor defense. They have rapid fire ranged weapons that can cut down swarms of enemy troops. However, they are few in number and need to choose their fights carefully. Harpies are commonly used to tie up some of the enemy's units, so you can focus on the rest. 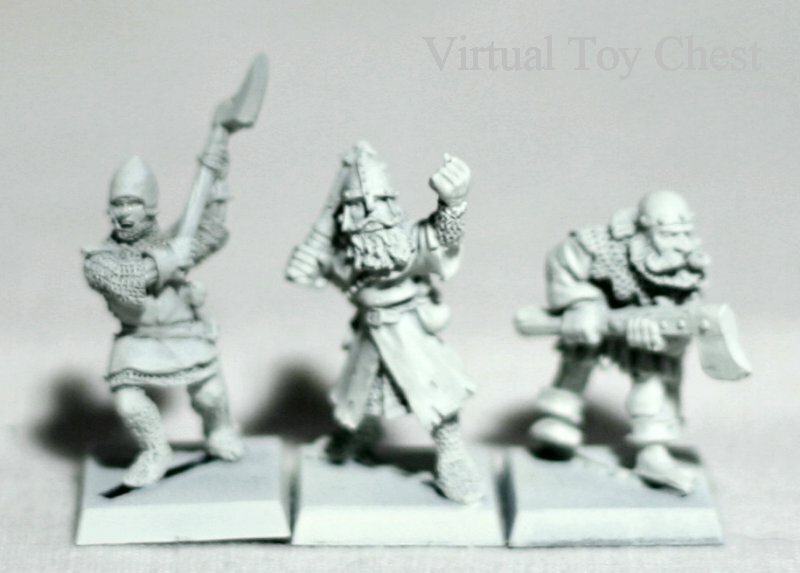 The stout Dwarves have powerful long ranged artillery and magic. However, they are not very mobile. Thus, their most popular strategy sit and shoot, which they do quite well. The Empire is based upon the German army. Their strengths are their cavalry and artillery. They also have gunmen and inexpensive foot troops. They are sort of the jack of all trades army. However, none of their troops is quite as good as those in other armies. The High Elves are an elite army. They are few but skilled. They generally rely on long ranged fire to soften up the enemy, and then focus on routing the remaining units one by one. One of their strengths is their mobility. This helps counteract their biggest weakness, low stamina. They must avoid drawn out combats at all costs. Hoards of Chaos are also an elite army. They have superior armor and can slug it out. However, they are generally slow moving and lack atrillery support. It is essential to make sure that your elite troops do not get bogged down in combat with foes such as light cavalry. The Lizardmen are based upon the armies of South America. They have vicious warriors and powerful magic users. One popular strategy is to screen their deadly Saurus Warriors with expendable skinks. In many ways the Orcs and Goblins are similar to the Lizardmen. The Orcs are powerful warriors and are commonly screened by the weak Goblins. The Orcs are not as powerful as the Saurus, but are less expensive. Thus, an orc army can field a huge number of troops. 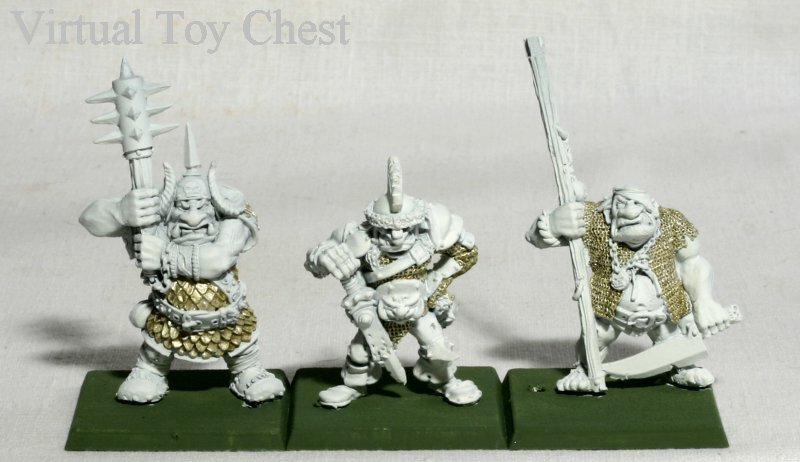 The Ogre Kingdoms are also similar to the Lizardmen. Whereas the Orcs are less powerful than the Saurus, the Ogres are more powerful than the Saurus. They are accompanied to battle by the small but numerous grotts. The Skaven are a race of ratlings. Their numbers are legion. They also have infiltrators that can take out important targets like artillery. The Tomb Kings are based on the ancient Egyptians. They use massed archery and Chariots to achieve victory. Carrions are an important unit, as they can be used to destroy artillery, or tie up enemy units. The Vampire Counts are the perfect army for Haloween. Most of the troops are weak. However, they come in large numbers and do not run away when defeated. The Vampires are exceptionally powerful. The Wood Elves are somewhat similar to the high elves. However, they make even greater use of skirmish tactics. They generally make good use of terrain, and pick away at the opponent. For many years the figures were exclusively produced by Citdel Miniatures, an arm of Games Workshop. In years past, most of the figures were cast in pewter. Now, many of the figures are made from plastic. Special units are made by Forge World Miniatures and cast in resin. Warhammer has spawned numerous other games. The most notable of these is Warhammer 40,000, which is a futuristic version of the game. There have also been role playing versions like Warhammer Quest, Mordheim, the epic scale Warmaster and Man O War, and Blood Bowl.